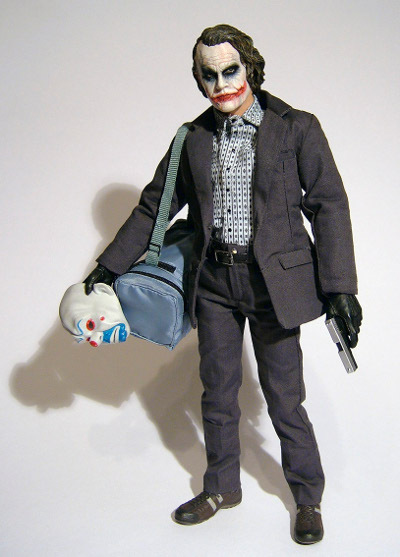 Jeff checks in tonight with his look at the cool Bank Robber Joker! I gave my take on it last week, but it's well worth another review. What's your thoughts, Jeff? Thanks as always to our gracious benefactor, Mr Crawford. And so onto what is for many one of, if not the most anticipated figure of the year, well I say that we are just at the dawn of 2009 and already the relentless march of ‘must have’ 1/6 figures carries on. But with the economy showing no signs of picking up just yet, it’s going be a year of painful choices for many collectors. For me personally the 2009 ‘sell a kidney’ moments look to be the MK I and MK III- IRONMAN figures, but it’s early days, so things can all turn on a sixpence! 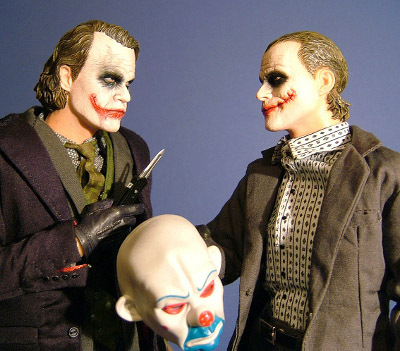 But looking back, it’s plain to see why the Bank Robber Joker (BRJ) is such a wanted figure, and the reasons are like its choice of heads, twofold! 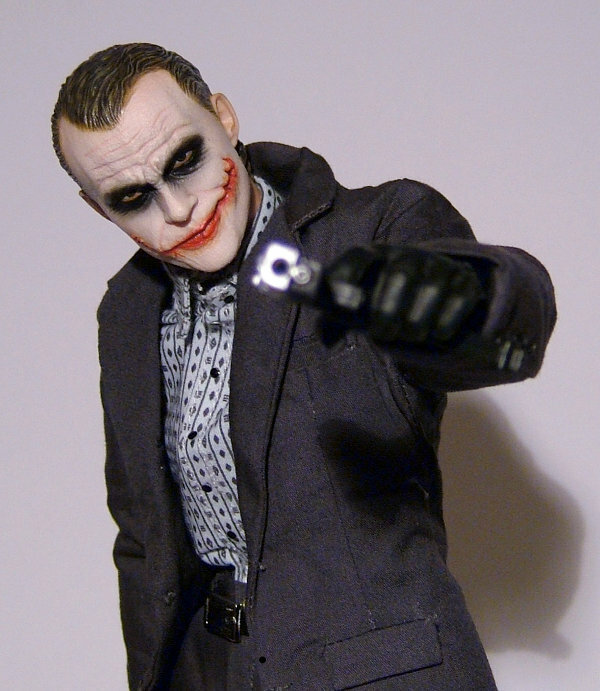 The first reason is, that as I just stated, it comes with not one, but two strikingly brilliant head sculpts, and the second is that many people purchasing this will already have the first Joker Hot Toys (HT) brought out in his more iconic outfit, complete with long purple coat. 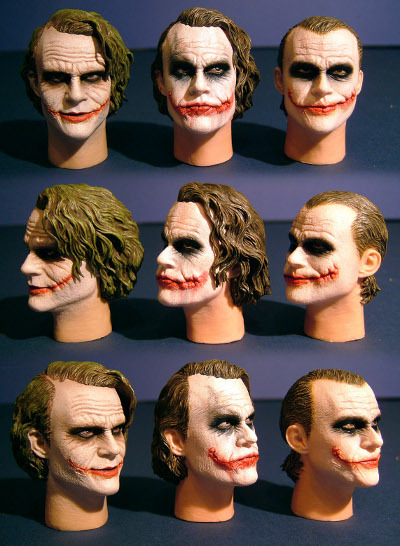 The head sculpt available with that figure was, and indeed is in many ways still regarded as small work of art, and with the limited reference made available for HT to pass onto their ‘head’ sculptor (pun intended!) Yulli, it remains a great piece of work. 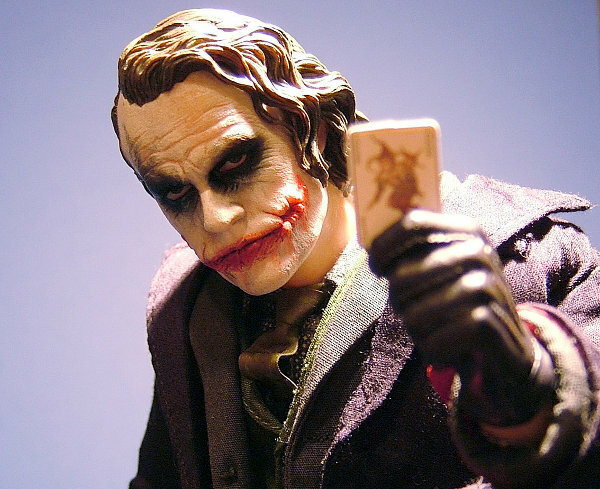 However once the film was released images of Ledger as the Joker were far more easy to come by, and with the character appearing in a different ‘signature’ outfit earlier in the movie it gave HT the chance they needed to let Yulli work her magic on the agent of chaos all over again! 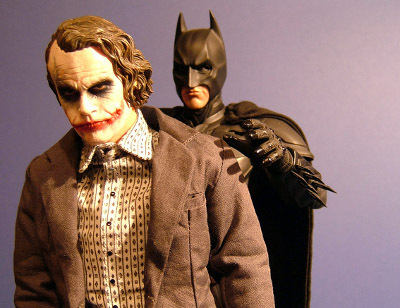 And so as a bonus to the fans we get two heads, so our already impressive original Joker can be elevated to near perfection with the simple swapping over to the new head… genius! If it wasn’t for the simply outstanding boxes that came with the ALIEN Nostromo, cosmonauts then this would have got my packaging design of the year, and it’s no coincidence that like them this is again the work of Dixon Chan and Monster Jr.
A very striking bit of graphic design utilising a large digital illustration of the Jokers bank robber mask surrounded by ‘Jokerised’ $’s covers the front of the sleeve, with pics of the figure in his different head/mask modes and accessory details on the back. 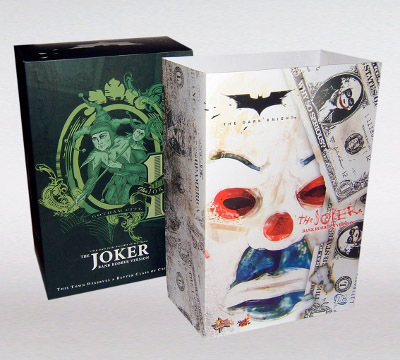 The inside box is the usual 5 panel flap fronted affair, it has a large illustration of a ‘Joker’ playing card on the front and a stylish photo of the mask hanging in the Jokers hand along side a list of production credits on the back. The inside flap has another photo of the figure with a brief bio printed underneath. 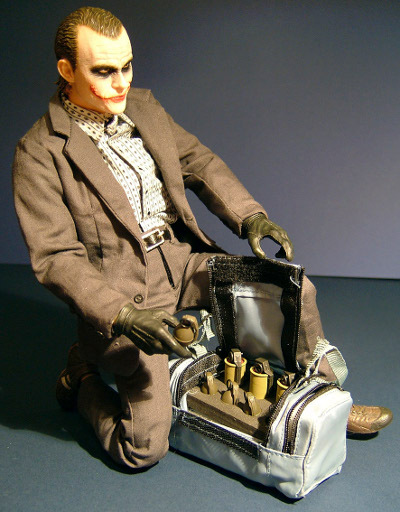 Pull out the tray and you’ll find the figure housed in a vac formed tray, held securely by 5 twisties with his various extras and accessories arranged around him, a simple, classic box but designed beautifully, a great one for the MIB’ers to display with pride. Beautiful, just beautiful, both these heads are simply breathtaking, and like the cannibal Jack Sparrow from earlier last year they just seem to capture the essence of the character. 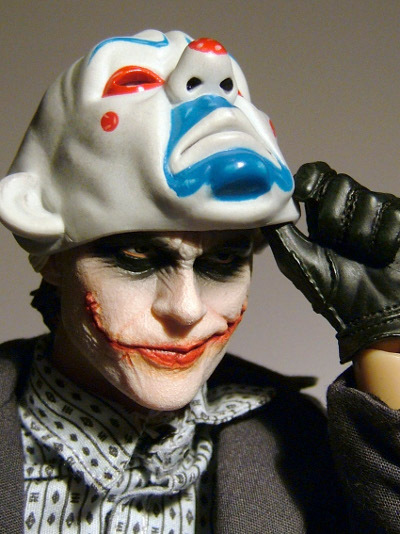 The head designed to wear the mask has a slightly bemused smirk, his eyes are looking out straight ahead and the hair is slicked back. 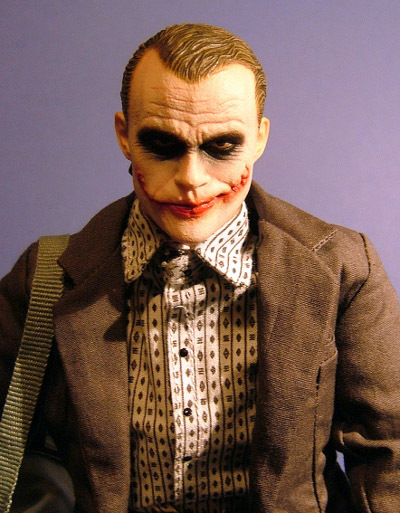 Head two is more representative of the characters look through the majority of the movie, the face is more determined and threatening, with his slight sideways glancing eyes, and the lank hair falling greasily to frame his nightmarish face. 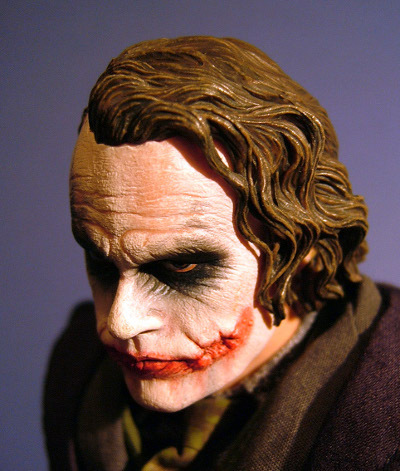 I just love these two sculpts, they very accurately embody the way Heath Ledger looked whilst in character and the fine work Yulli has done on the facial scaring around the mouth blows her earlier version out of the water in terms of accuracy, and the hair is sublime each tress and strand is beautifully realised. As I said just beautiful! 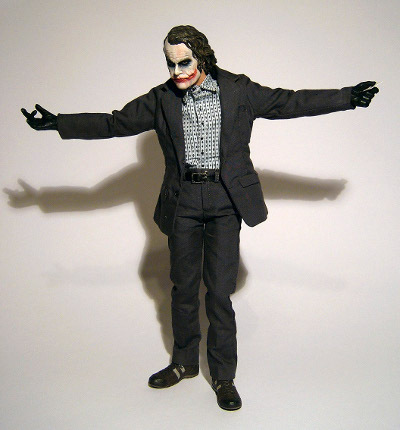 He also comes with four hands, two left, a gun grip and knife/card grip and two right, a general grip (ideal for holding the mask) and lastly a gesturing hand, the same sculpt as with the previous Joker, but great for posing and coloured black this time instead of purple. There are also quite a few sculpted accessories, but I’ll cover those later. To back up these two sterling sculpts JC Hong has pulled out all the stops to give us some of the best mass produced paint apps seen so far. These equal the cannibal Jack I mentioned earlier (though the complexity on that figure means it still keeps my top spot for now). The hair subtly hints at the Jokers washed out green dye, but the dirty brown is by far the dominant colour and the effect of the white greasepaint smearing to show patches of flesh showing through is masterful, as is the smeared panda eyes and blood red mouth. Once again JC’s glossy eyes bring these heads to life, with just the right amount of sheen to catch the light convincingly (c’mon Sideshow, drop the dot!). 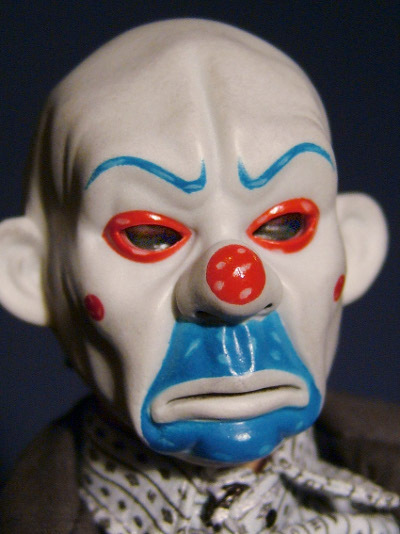 The ‘bank job’ mask also has some great work, the red and blue areas both show patches where the paint has rubbed off, but by design rather than through sloppy work, and the whole thing then has a dry sponged ‘dirt’ effect to tie the whole thing together. Many of the accessories also have some paint effects, as do the shoes, all carried out efficiently with no slop, top marks easily. Once again the True-Type described here helps make this figure stand… and indeed stoop very naturally, and with the right amount of tweaking and futzing you’ll get him into whatever pose you need, quite simply ‘still’ the best body out there at the moment, all the joints are firm without being stiff and he stays upright without the need of a stand (though one is supplied). Whilst not loaded, he certainly has everything the character needs, and indeed used, and the added bonus of the extra head means this has to be another area for full marks. 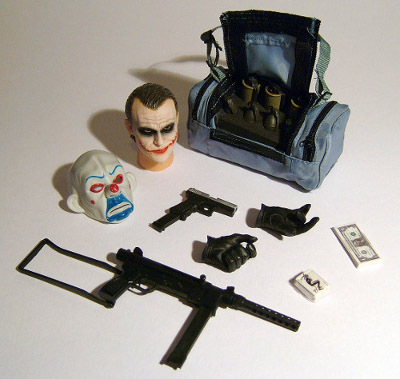 Both the guns are well put together and have removable clips and cocking mechanisms, the MK760 is more of an extra to go with the first Joker release as he used it when facing down Bats as he raced towards him on the Bat-Pod later in the movie. The holdall opens with a very well scaled zip, once opened you can remove the foam put inside to pad it out and replace it with a small black slab of dense black foam supplied, this has holes punched that can take the various fragmentation and smoke grenades. Well the clean sweep of full marks had to stop eventually, and though this outfit is expertly tailored there are just a couple of small little niggles that keep it from that top score. And those two things are the lack of socks and the tight collar on the shirt. I guess the socks could be considered a moot point, as we never actually see any in the movie, but I feel the shirt collar could do with being ever so slightly looser, it’s an easy fix, and to be fair it can be done up OK, but it tends to pull a little making the stud fastener show (at least it does on mine, you might be luckier). I hate to start on the negative because everything else is so good. The rest of the shirt fits fantastically, and the Velcro used to hold the front shut is much stronger than on the previous figure. The suit is up to HT usual 1/6 clothing standards in that it fits like a dream, they’ve even managed to make it look slightly tatty and lived in and all the details on the buttons and working pockets are to perfect scale. Like on the previous version they have managed to replicate the pattern on the shirt incredibly accurately and even though it has long sleeves under the jacket you’ll get no bunching or rucking up, it’s as near perfect to scale as I believe it’s possible to get at this time, and due to HT managing to source and work with such fine materials I think any customiser would struggle to match this for quality. 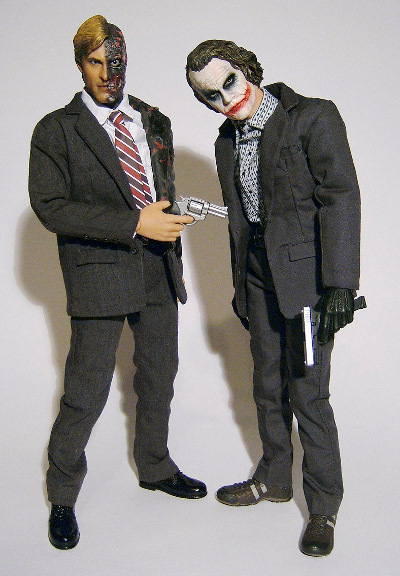 In the movie the Joker doesn’t spend that much time in this outfit, but the opening sequence of the bank heist is such a rollercoaster opener that many of the poses the character adopts in these scenes are almost more iconic than when he’s in the ‘regular’ outfit. 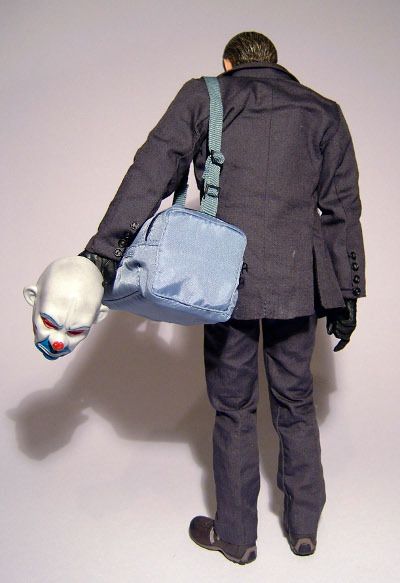 Take the scene where he’s waiting to be picked up, with his back to us, mask in hand, or standing in the bank, when he first takes the mask off to reveal his face… classic stuff, and this figure is perfect for replicating those poses. So as always it’s not a child’s plaything, but it’s still a wonderful toy! Hot Toys sometimes have a bit of a habit of spoiling us in the accessories department, and though this guy isn’t loaded that extra head is such a sweetener it makes the price a lot more user friendly. There were quite a few places you can pick this up, but due to it’s popularity some have already sold out on pre-order, and of course eBay is still very much an option with it going for between $130 to $199. 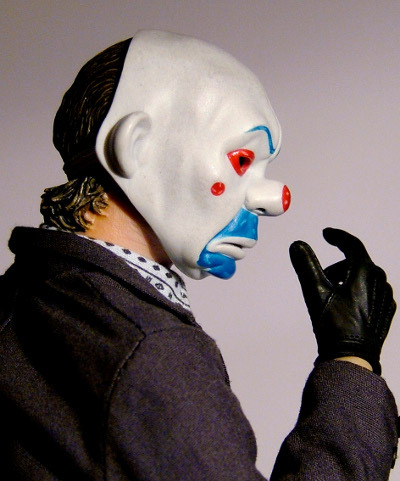 Some are being parted out with a premium price being asked for the heads so if you plan on keeping him in Bank Robber mode you could make quite a chunk back by selling your ‘spare’ head. I’ve based by score on a pickup of $160, if you go up to the RRP of $175 I’d perhaps knock another � star off. But there is no denying this is one sweet figure, and let’s face it with the state of stocks and shares right now it’s probably a better investment! I was fully expecting to like this figure a lot, but it’s better than I could have hoped. 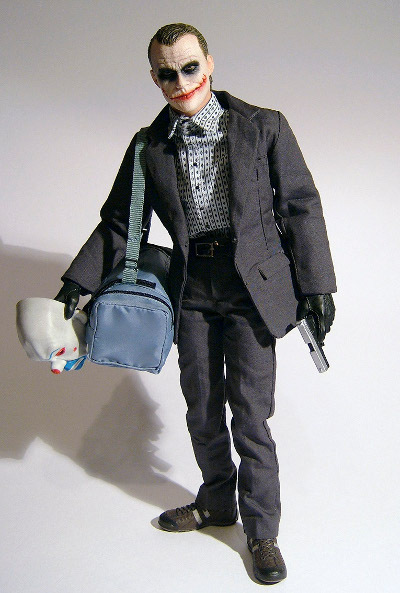 Originally I planed to swap out the head and display the ‘classic’ outfit, but he looks so cool with the bag slung over his shoulder pointing his gun ‘gansta’ stylee I decided to display him in this outfit… at least for now. 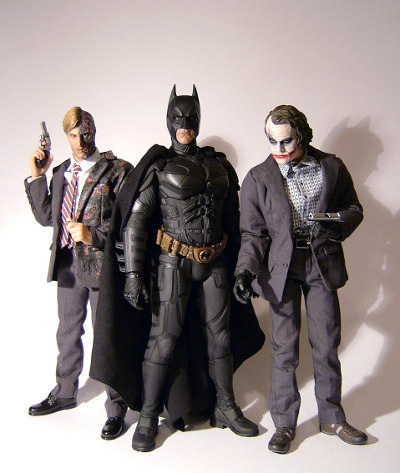 So for the time being I have TDK Bats centre stage, flanked by BRJ and Two-Face… makes for onehellova set-up. 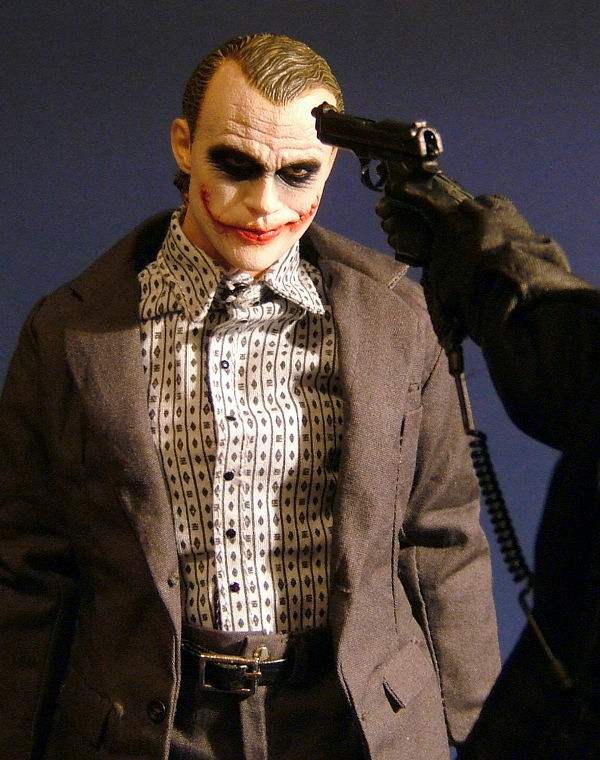 It’s definitely one of the ‘must haves’ in the 1/6 collectors catalogue, and along with Dent/Two-Face a great way for many to kick off their New Year, a classic. 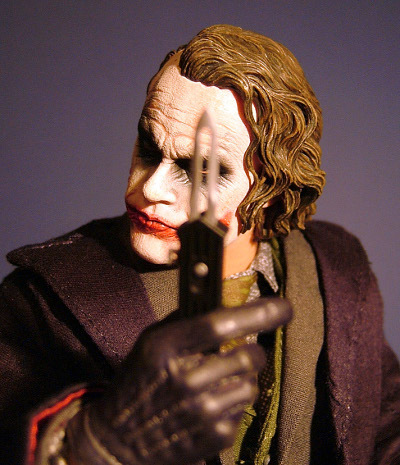 Officially the Importer on this figure is DC Direct and they have it up for $175 on pre-order. 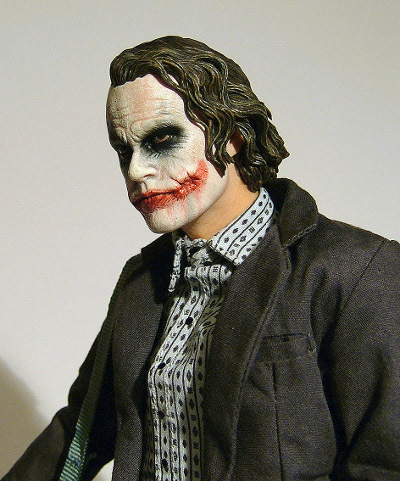 Showpiece Collectibles has a great price at just $150. - or you can search ebay with the sponsor MyAuctionLinks.com.